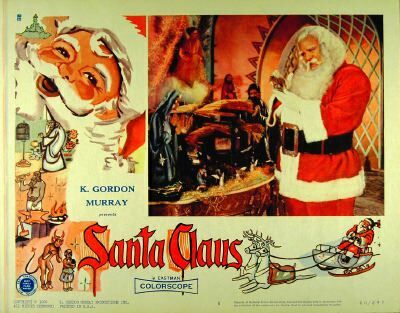 Digi-Schlock: SANTA CLAUS (1959) (VCI Blu-Ray) – Schlockmania! 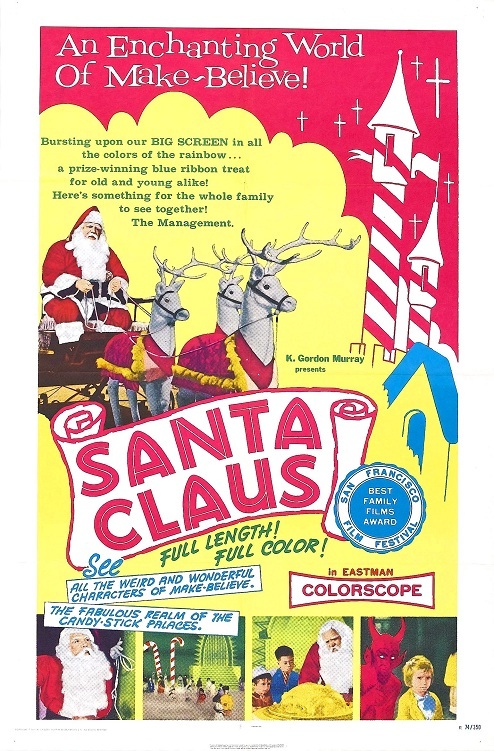 Santa Claus has always been one of the bargain bin warriors of the cult movie world: in other words, a popular title amongst trash aficionados that has never gotten a proper release due to tricky rights situations and a number of grey-market editions. It recently got a new kick at the can via a blu-ray edition from VCI. While the results aren’t as technically pristine as fans might have hoped for, it’s a big improvement on past discs and adds a number of swell, subject-appropriate extras in the bargain. This transfer was taken from a film source: the element mostly looks good but there is the occasional bit of damage, mainly a few scratches that run down the right side of the frame on a few occasions. A couple of brief sections seem faded in their colors in comparison to the rest of the film and there are also a handful of moments where the frame seems to briefly “flash” as if the color timing slipped for a second. It’s also worth noting that the disc claims to have both the Mexican and K. Gordon Murray versions of the film. This is only partially true: this appears to be a Spanish language print that is edited to reflect the American version, excising one sequence in set in hell, but retaining the original Spanish language titles and signs used in the Mexican version. In fairness to VCI, they do include the excised Hell sequence and the English language titles and signs in a deleted scenes section. That material is taken from a video master that was drawn from a 16mm source. As for the transfer itself, it’s a mixed bag: color representation is pretty strong, particularly the vivid primary reds on Santa’s and Pitch’s costumes, but the detail level wavers depending on the closeness of the shot. Close-ups fare the best while wide shots get kind of hazy in detail. The end result isn’t an ideal blu-ray transfer but it’s still a big step up from all the dupey, standard-def transfers of Santa Claus that have flooded the grey market for years. Both English and Spanish mono soundtracks are provided: aside from the occasional pop, both sound fine. 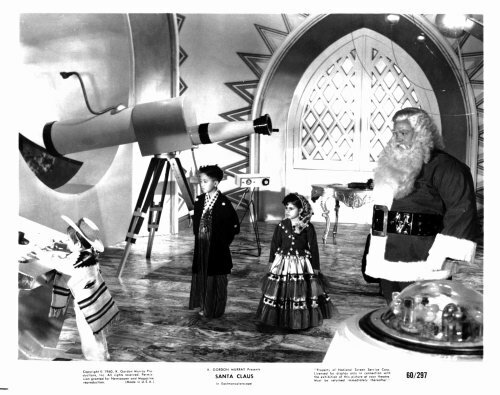 Subtitles are provided for the Spanish track but unfortunately they are printed in white lettering that blends into the background, particularly during the scenes in Santa’s castle. There is also a 5.1 remix for the English language track but it’s an artificial-sounding affair that is too boomy to make a comfortable listen. The best element of the disc is a surprisingly generous assortment of extras. Viewers are treated to theatrical, t.v. 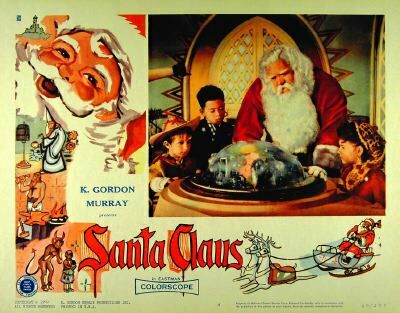 and radio spots for Santa Claus, all built around K. Gordon Murray’s unique showmanship (the film was put out as a limited weekend-only engagement). In addition to the aforementioned deleted/alternate scenes, there are also a trio of “Santaland” shorts that Murray assembled by shooting footage at Santa-themed roadside attractions. Two of these shorts use footage from Santa Claus itself and all three use other “mascots” that Murray adopted from his other Mexican releases, albeit in cheaply-redesigned costumes. This little trilogy is a smirk-inducing trip back to when kiddie entertainment could be really cheap and weird. Elsewhere, there is an unexpectedly comprehensive animated stills gallery that features all sorts of ad materials (print ads, posters, color & black and white stills) as well as a Christmas-themed Howdy Doody short. That said, the best bonus inclusions come from Daniel Griffith. He does a commentary track for the film that works quite well thanks to his extensive knowledge on K. Gordon Murray and the films he distributed. 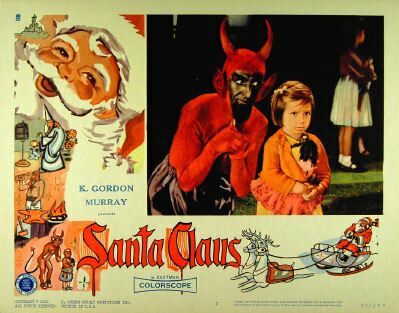 His comments cover the history of the personnel involved, how Murray repackaged and sold it to an American audience and, most interestingly, the fact that the Santa Claus legend wasn’t part of the usual Christmas celebrations in Mexico, which leads into discussion of how the filmmakers tried to make it palatable to their home audience via a number of eccentric additions to Kris Kringle lore. 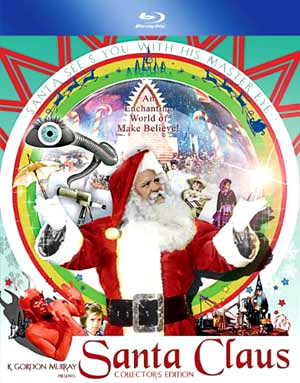 The commentary is nicely complemented by “Santa Claus Conquers The Devil,” a new featurette that presents a concise, 14-minute introduction to the mind-melting wonders of Santa Claus. It incorporates input from cult film personalities like Larry Blamire and MTS3K‘s Kevin Murphy as it divides its time between explaining how this odd film came to be and the effect that it had on the young American minds that viewed it during its initial release. As usual with a Griffith featurette, it has nice graphics and a punchy editing style. In short, this is a flawed disc but the uptick in visual quality and particularly the supplements make it worthwhile for anyone obsessed with this holiday oddity. If Santa Claus is your cup of yuletide madness, it definitely beats those grey market dupes.